I am proud to announce that my studio, Evolved Body Arts, has launched it's own line of tattoo care products. 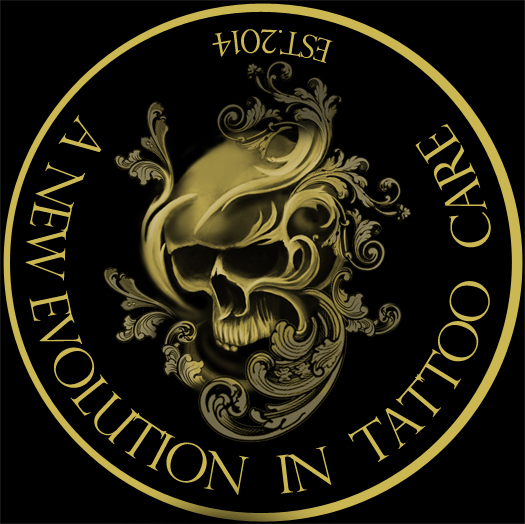 It's time to evolve with EVOLVED TATTOO CARE. ATTENTION ARTIST: We currently offer TATTOOING BALM, all natural vegan/vegatarian friendly and cruelty free. Absorbs effortlessly and possesses a natural anti-inflammatory to reduce redness and swelling during the tattooing process. Also available is our evolutionary HEALING BALM, all natural and also vegan/vegatarian friendly and cruelty free, absorbs effortlessly, smells amazing and also reduces redness and swelling. It maintains moisture for optimum healing results. The mighty SUN STICK helps protect your works of art from uv solar fading over the course of its lifetime. It comes in a convient "glide on" stick making it's application effortless. This product does contain beeswax. Our TATTOO REMOVAL BALM is again all natural, vegan/vegatarian friendly and cruelty free. It contains vitamin E oil for optimal healing results after undergoing a tattoo removal procedure.